An important recent milestone for the SustainTrans team was when Henrik Ny on December 11 in 2018 was invited to present a new research project idea to the civil servants group within Climate Cooperation Blekinge. This group is led by the County Administrative Board and primarily consists of environmental coordinators and experts from Region Blekinge, the regional energy advisors, the Energy Agency Southeast and all Blekinge Municipalities. The general task of this group is to run the hands-on cooperation for accelerated transition to a fossil free Blekinge among the public actors. More specifically, Henrik’s presented the Roadmap project idea on how to forge a stronger coordination in and between the municipal and regional levels when building the roadmaps for a fossil free Blekinge. By building on what is already happening and suggesting well-anchored solution ideas the idea is that this project could be a catalyst for real change in the region. The County Administrative Boards tasks to suggest climate-related goals and strategies for Blekinge. The new project ‘Combined Mobility in Blekinge’ and the TRAM project that both puts forward more efforts on biking and demand responsive public transport. The Interconnect project and its efforts on strengthening public transport in and between the regions around the South Baltic. The preparations for the new procurement period for public transport in Blekinge and regional plans for new public transport infrastructure. The updates of comprehensive plans of the Blekinge municipalities. The regional development strategy for Blekinge. The Meeting resulted in a consensus to go forward with the Roadmap project idea together. Figure 1. 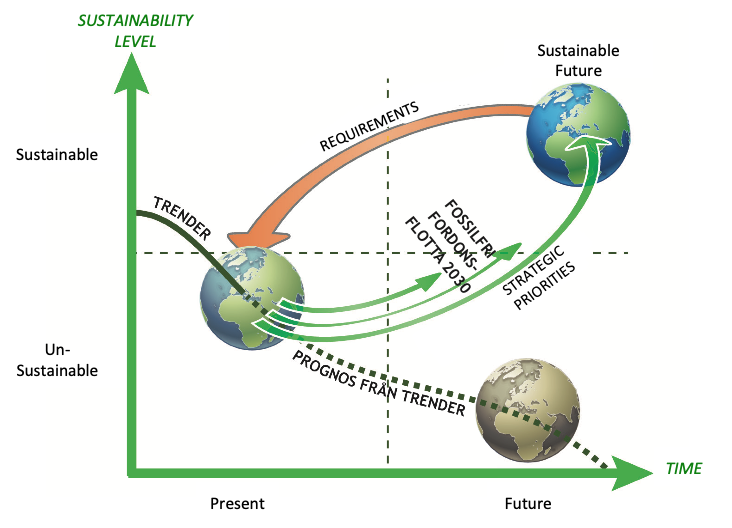 How the new Roadmap project is intended to help the region to change its strategic priorities to switch from the current trends towards a more unsustainable Blekinge to a fossil free and sustainable future (illustration by Stefan Borell).